OK, so it’s not one of the biggest impacts of a warming world, but it’s certainly an annoying one: A bug that produces sap that falls from trees onto our cars benefits from warmer temperatures, according to a new study. But that’s just one example of what could happen in a warmer world: Some species do better at the expense of others — and the beneficiaries might be real pests. In this case, female scale insects sampled from oak trees in warmer areas of Raleigh, N.C., produced twice as many eggs as those in cooler areas, the North Carolina State University researchers found. The reason: While the scale insects are starting to lay eggs earlier due to warmer temperatures, the wasps that prey on those insects are not developing earlier. Biologists call that a “phenological mismatch” — a change in the synchronized seasonal relationship between organisms. “Phenological mismatch has been shown in a few other systems,” such as the relationship between plants and pollinators and fish and phytoplankton, lead author Emily Meineke told NBCNews.com. In the case reported this week, it’s a mismatch driven by warming temperatures, which represent “a new mechanism for urban pest outbreaks,” the researchers write. The symbiotic relationship works this way: A female wasp relies on a scale insect to raise her young, punching a hole in the insect’s shell and laying her eggs inside the cavity. The wasp eggs lie dormant inside the host over winter and hatch come spring. The infant wasps then feed on the blood of the scale insect, which is simultaneously producing her own eggs. 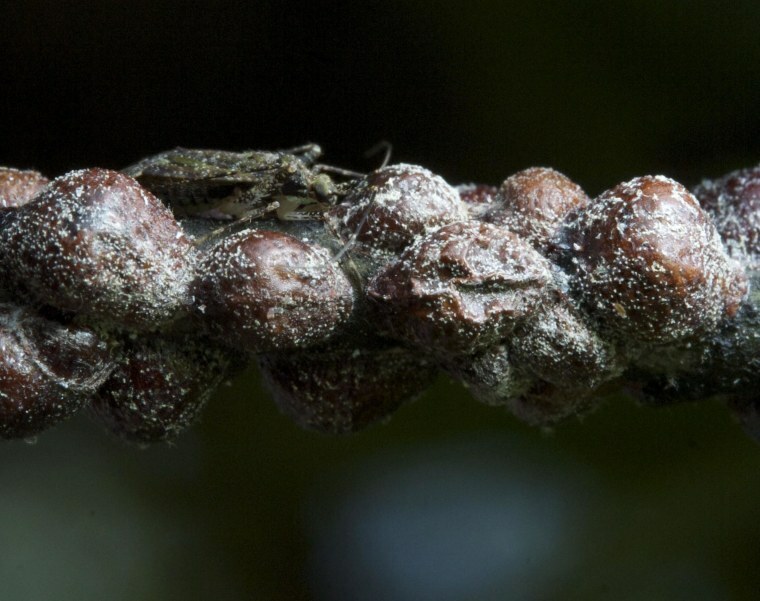 When wasp larvae hatch early in the scale insect’s egg development cycle, as is the case in moderate climates, those larvae weaken the insect, causing it to produce fewer eggs. But warming temperatures throw that relationship out of whack. "The wasp larvae aren't affected either way — but the warmer temperatures clearly limit the impact that the wasps have on scales," Meineke added. "Basically, with global temperature increases, one way that nature used to limit scale populations may not work anymore." The changing relationship also means a rougher time for the oak trees that host the scales and wasps. But scientists say warming's effect goes both ways: Some pests take a hit. “As climate change begins to exceed the historical range of conditions, we can expect to start seeing more cases,” agrees Matt Ayres, a Dartmouth College biologist who specializes in insects and climate. In the case of pest species, he adds, society would be well served to be more proactive.